Once the dust settled after moving, Brian began working on the old house getting it ready to sell. It went on the market last Thursday. Earlier that week I spent some time putting the finishing touches on a few things and meeting with our realtor (and friend) for pictures and necessary paperwork. Throughout this whole process I've had friends ask me, is it sad to leave your house? The house that you guys built? The house that you brought home three out of five babies to? The house that you lived in for over twenty-one years? The house where you have good friends and playmates in the neighborhood? Not to mention the best mechanic ever right across the street! To everyone who asked me, I want to let you know I finally had my emotional moment. Isn't it funny how these things will sneak up on you unawares at times? My moment came as I watched my realtor friend pierce the soil with the for sale sign. Suddenly, I found myself choking on lungs that had jumped up into my throat. I blinked back tears as I realized this was it. We are giving someone else permission to buy our home. Strangers will let themselves in, walk through, and scrutinize. The home we built. The home where we raised our kids. Just to put this into perspective, my moment only lasted about five seconds and I didn't command my friend to remove the sign from our yard. It's good to know that we are in a new season and to acknowledge that God has provided and guided us to where we are now. The home we are leaving will be a blessing to somebody else as it was a blessing to us. These two rocks came out of the hole we dug for the basement. Our friend used the backhoe to move and stack them in the front. The weeping mulberry tree came from my friend's house. She hated it and was going to get rid of it. I loved it, so our husbands dug it up and replanted it for me in the front next to the rocks. It was only about 4 feet tall at the time. It now stands a proud 12 feet high! 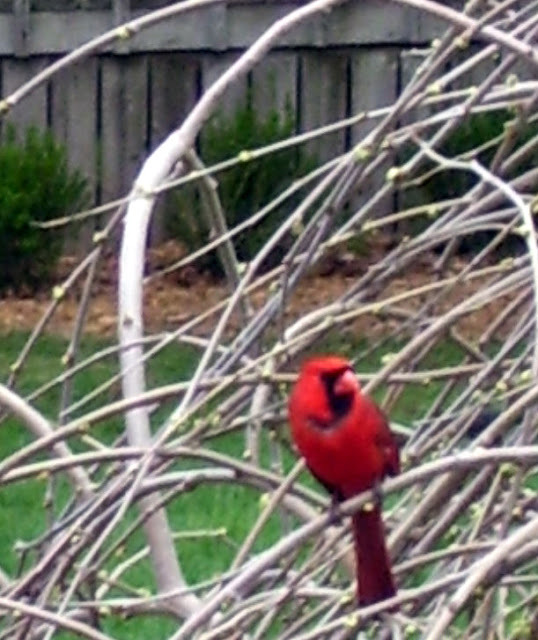 Every year we had two pair of cardinals nest in the weeping tree. In fact, we saw the males when we were there a couple days ago. were standing the front yard. I'll miss the custom cabinetry that was made by our friend's dad. I stained and polyed every piece of wood in that house. But, not so much the peach countertops - what can I say? Brian started messing around in the yard last weekend. We're now ready for a nice, safe bonfire. Silas and his friend, Cameron, drove the mower & trailer around the yard gathering rocks for the border. I'm thinkin' this might just do the trick. OK....the names in concrete brought tears to my eyes (we have the same sort of thing at our house!) And - I think I need one of those big rocks. I do believe I (accidentally of course) ran into those once !!! What? You ran into my rocks? When was that?